Historic Denver accepts applications for our Action Fund program a couple times throughout the year. The deadlines for 2019 are February 1st and August 1st. Applicants are strongly advised to reach out to staff to discuss their proposal before submission. The Action Fund is designed to catalyze innovative neighborhood and community projects that enhance the city’s unique identity, promote and maintain authentic character, and honor cultural heritage as reflected in the built environment. Through the Action Fund, Historic Denver will select one to three community or neighborhood projects each year. Projects will receive technical assistance, staff support and direct financial investment from Historic Denver, ranging from $2,500 to $10,000. Projects will be selected through an annual competitive application process. Historic Denver is proud to once again accept applications in 2019. Deadlines are February 1st and August 1st in 2019. Historic Denver will once again accept project applications in 2019 on February 1st and August 1st. Applications are due (and must be received) by 5 p.m. on the day of the deadlines. Any late applications will not be eligible for review in that round. Application instructions and forms are available below. Applications can be submitted electronically using the form at the “Apply Now” button below, or mailed or delivered to 1420 Ogden St., Suite 202, Denver, CO 80218. Applications must include a completed application form, evidence of eligibility, completed budget form and three letters of support. If any of these documents are not included in the application, it will not be eligible for review. It is strongly advised to reach out to Historic Denver staff to discuss your project before submission. The Action Fund is not a grant program. Historic Denver will retain the funds for each project and release the funds directly to cover expenses related to the effort, such as consultant or contractor fees. Funds will not be given to private citizens or property owners. A six member selection committee will review all applications and make a recommendation to historic Denver’s Board of Trustees. Historic Denver retains the right to select projects at its sole discretion, and may elect to select no projects in any given year. All applicants are strongly encouraged to contact Historic Denver before submitting an application. Questions can be directed to Historic Denver, Inc. 303-534-5288 ext. 6 or info@historicdenver.org. To apply to the Action Fund you must click on the “Apply Now” button below to be directed to the full online application form. As a part of the application you are required to upload your Budget Spreadsheet detailing the cost estimates for the entire project (including consulting fees, etc. ), as well as the amount requested from Historic Denver’s Action Fund, and the amount you will raise as the cash match. This is a selection of some of the Action Fund Projects currently being worked on. The Vassar Bungalows are a special set of six historic, Spanish-style homes located on East Vassar between Lincoln and Sherman Street. All six of the homes were built in 1926 by the same builder on the site of the demolished Vassar School, an early Denver Public School building. Remnants of the school’s wall still surround the six lots and create a cohesive streetscape. 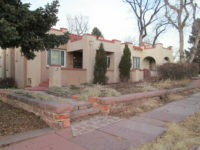 The residents and owners of the bungalows formed a five-member group endorsed by their RNO and Denver City Councilman Paul Kashmann and applied to the Action Fund to achieve their goal of having the homes designated as a historic district. A small historic district will ensure the bungalows’ collective character remains as the intense pace of demolition on surrounding blocks continues. La Alma Lincoln Park Neighborhood Association applied to the Historic Denver Action Fund to complete a neighborhood resource survey. More than 90% of the homes in this area were built in the 1800s, and the area is significant for its role in early Denver, and for 1970s-era activism as part of the Chicano movement. The survey includes community engagement and oral histories, and will provide the foundation for future action that ensures this important part of our city’s architecture and history is not lost. The community is currently pursuing a Historic Cultural District with input from a number of community meetings. You can find out about upcoming meetings in teh neighborhood on Historic Denver’s Facebook page. The Historic Context document has been completed from this project and is available for download here: La Alma Lincoln Park Historic Context. When Denver updated the city zoning code in 2010 it included a new tool, the Conservation District. Conservation District are different than historic districts because they do not regulate demolition of historic structures and do not require design review of modifications. However, conservation districts can create special zoning that supports the character of a neighborhood. For example, if your neighborhood is a low-slung, mid-century neighborhood you can create zoning that reinforces these attributes and requires new construction to meet certain, objective, parameters. If you neighborhood has tall homes on narrow lots, a conservation district can provide the opportunity to built a little differently than allowed in a typical zone district. Like historic districts, conservation districts must ultimately be approved by the Denver City Council. Unlike historic districts conservation districts require 51% landowner consent. Historic Denver has created four Pattern and Design Idea Books to provide inspiration to homeowners that reside in neighborhoods that characterize a particular period from our history, but are in areas that are gaining popularity and are experiencing development pressure. Both minor remodels, which don’t alter the exterior of the home, and major remodels, which increase the square footage of the home, are presented. 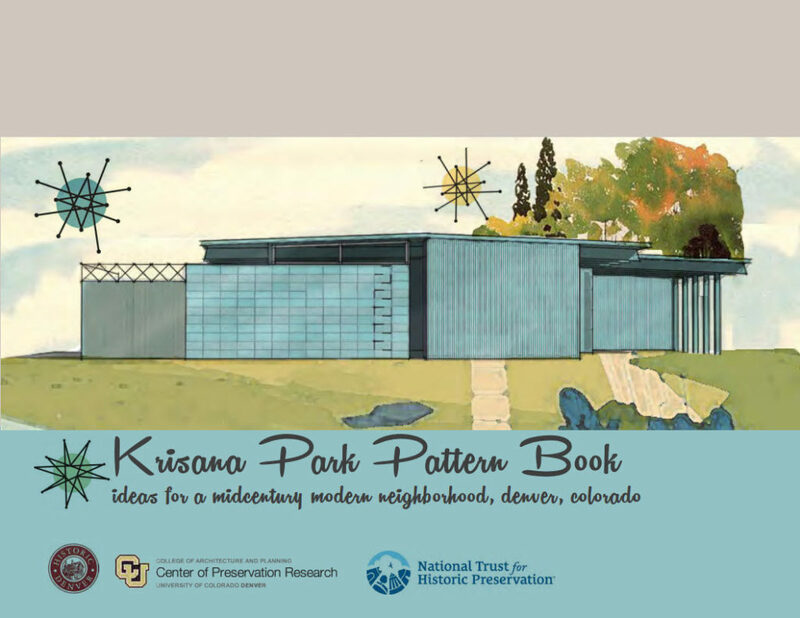 To view the Pattern and Design Idea Books for Krisana Park in Denver, Pre-WWII Homes in Arvada, Post-WWII Homes in Arvada, and Post-WWII Homes in Aberdeen Village, Littleton. The Krisana Park Pattern and Idea Book is now complete! 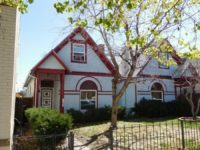 This project was funded by the National Trust for Historic Preservation, Historic Denver’s Action Fund, and through individual donations from neighbors in Krisana Park, and produced in partnership with the Center of Preservation Research at the University of Colorado, Denver. Krisana Park is an excellent case study of Mid Century Modern architecture in Denver. It is also an area that is gaining in popularity and so far has been shielded from the development pressure that is present in many of Denver’s most historic neighborhoods. The book illustrates contemporary remodels and additions that can add much needed space to these homes while also honoring the historic aesthetic of the neighborhood. On November 21, 2016 Denver City Council will consider a conservation overlay for Krisana Park so that this special character is honored! You can purchase a copy of the pattern book today, quantities are limited! Historic Denver Inc., in partnership with the City of Arvada and the Colorado Center for Community Development, has developed two Pattern and Design Idea Books for home types that are common in Arvada. Each book focuses on a particular era of development, the first being the time prior to World War II, which was primarily characterized by an agricultural economy in Arvada. The second book focuses on the period following the War, which featured explosive population growth and rapid suburban development. The goal of the Pattern and Design Idea Books is to provide inspiration to homeowners that reside in neighborhoods that characterize a particular period from our history, but are in areas that are gaining popularity and are experiencing development pressure. Both minor remodels, which don’t alter the exterior of the home, and major remodels, which increase the square footage of the home, are presented. 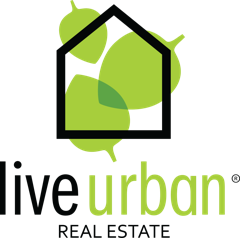 Historic Denver Inc., in partnership with the City of Littleton and the Colorado Center for Community Development, has developed a Pattern and Design Idea Books for home types that are common in Aberdeen Village Subdivision in Littleton. The book focuses on the era of development following World War II. Across the nation modest homes are being demolished in order to build larger homes that often do not fit the character of their neighborhood. The full impact of this trend has not yet reached Aberdeen Village, but development pressures are expected to increase as Littleton’s attractive community and proximity to Denver continues to draw new residents to the area. By looking at the success of similar projects (notably Minnesota’s ‘Cape Cod and Ramblers’ Pattern Book and Wheat Ridge’s ‘Ranch Renovation’ Idea Book), it was decided that a pattern book would be a valuable tool for homeowners to visualize sensitive home modifications. The majority of Aberdeen Village’s housing stock is comprised of single and split level ranch homes. Though the architectural details vary in terms of materials and window placement, the housing forms are similar. A community meeting was held early during the planning phase for this patternbook, both to establish interest within the community and to determine which housing types residents would like to see included. Prior to the meeting the neighborhood was surveyed, photographed, and the homes grouped by type. Historic designation is one method of ensuring that changes to a neighborhood occur thoughtfully, preserving the fabric of a neighborhood that people love — homes with history, vital dwellings that preserve the past — while acknowledging modern lifestyles. Navigating the ins and outs of the designation process and what it means for your property, however, can be a difficult task. We’ve created a Historic Designation FAQ guide, which answers many of the questions we commonly receive from property owners. Are you interested in proposing a historic district for your neighborhood? Local historic district designation is most common form of historic designation in Denver, and the most useful in terms of offering protection from demolition and design review. You can read more about historic designation in our Resources section. Ultimately a formal application must be submitted to the Denver Landmark Commission and then approved by City Council, but there are many steps to take before initiating the formal process. Follow the steps below to get started! Historic Denver can help you get started, speak at community meetings, and provide information about the designation process and provide research advice so that you don’t have to reinvent the wheel! If you are looking into a Historic District for your neighborhood you can also apply for direct support from Historic Denver through our Action Fund (although individual designations do not qualify for the Action Fund). As a reminder, Historic Denver is a non-profit advocacy organization and does not grant historic designations- we provide support through the process. The process and ultimate decisions are conducted through the City & County of Denver, Community Planning & Development Department and the Denver Landmark Commission. The City of Denver processes local landmark designations. You can find the required criteria, application, and sample applications on the Denver Landmark website. If you are interested in State Register or National Register visit our designation FAQs for more information. Identify neighbors who are interested in designation and organize a committee to lead the effort, conduct volunteer tasks, raise funds, and demonstrate grassroots support. This group must be committed to seeing the project through from beginning to end. Also, make contact with your Registered Neighborhood Organization (RNO) if one is active in your area. Using initial understanding about an area’s history and geography establish a preliminary boundary for the proposed district. The boundary may shift some as additional research is completed. Selecting a smaller, more cohesive area is generally more manageable than selecting a very large area, but historic districts range in size from one block to several hundred homes. Before you get too far it’s wise to check-in with the Denver Landmark Commission staff. You can review the requirements for historic districts, discuss what makes for a strong application, and gain important feedback and guidance regarding whether the area is likely to meet the eligibility criteria. You can reach the staff at landmark@denvergov.org. With the preliminary boundaries agreed upon, create a map of the proposed area. Conduct a “windshield” survey, photographing each property and researching its year of construction through the Denver Assessor’s office. This will help establish a period of significance for the district, which is essential in defining which properties are “contributing” and which are “non-contributing” (because they were built at a later time or lack integrity). Conduct research on the history, architecture and geography of the proposed district, highlighting particularly important properties. Some neighborhoods elect to conduct this research on their own using dedicated volunteers who are willing to put in significant time to visit the library to research individual properties, larger historical trends affecting the area, and the common architectural styles. Other neighborhoods elect to hire consultants to do this work. For suggested consultants please contact Historic Denver. It is important to host at least district-wide meeting early in the process. This provides property owners the opportunity to learn more about the process, express concerns and ask questions. Provide written information so owners have something to refer to during the meeting and once they go home. We suggest using Historic Denver’s FAQ on historic designation. This meeting can be held at the very beginning of the effort, or after initial research is complete, but should definitely take place before a designation application is submitted. Be sure to publicize the meeting widely. Communication early and often is key to the success of any historic district proposal. Be sure to reach out to all property owners in the proposed district with basic information by delivering fliers door to door, sending registered letters, and posting on neighborhood social media outlets. This should be done at several stages of the process and in advance of any public hearings. Keep a list of each outreach effort to demonstrate that ample effort was put into informing all property owners about the project. Successful historic district applications will demonstrate significant support from those affected. Develop a petition where you can track owners that support the designation, owners that oppose the designation, and owners who are neutral. Make a concerted effort, through your outreach, to connect with all property owners. Identifying a block captain for each block affected by the district may help. Plan to present the petition/list to the Landmark Commission and City Council. Applications must be thorough and well-researched and demonstrate that the proposed district meets the criteria established in Denver’s Landmark Preservation Ordinance; these criteria include architecture, history and geography. Applications must also identify which properties are “contributing” and which are “non-contributing.” Again, this can be done by volunteers or by a professional consultant. The application form, instructions, and samples can be found at denvergov.org/preservation. The application, along with the required fee, is submitted to the Landmark Preservation Commission. Once your application is submitted a formal process begins, and there will be several opportunities for property owners to provide their perspective. The Landmark Commission will hold a public hearing, and if they recommend the application, City Council will also host a public hearing. It is important to demonstrate great support at these hearings, so publicize them to all property owners and rally supporters to attend.